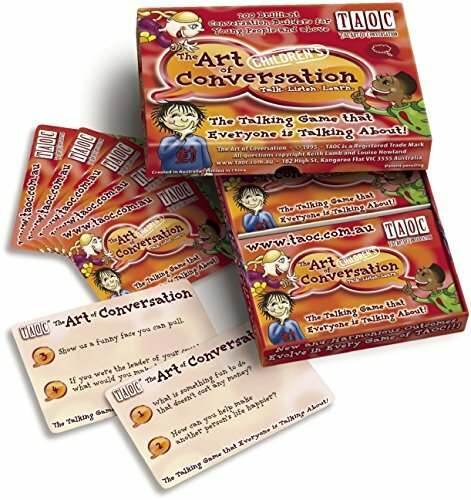 The Art of Children's Conversation is the perfect way forchildren to become great communicators as they learn more about themselves andothers, develop concepts and ideas and grow strong relationships.Professionally researched and developed by teachers, counselors, healtheducators, parents and a diverse range of children, the Art of Conversationbrings extraordinarily positive results. From the Manufacturer Turn off thescreens and enjoy communication. The Art of Conversation for Children is theperfect way for children to become great communicators, learn about otherpeople, better understand themselves, all as they enjoy great times andstrengthen bonds with family and friends. Everyone wins! TAOC helps children:Make friends and be friends. Speak well and with confidence. Listen withinterest and understanding. Share ideas and feelings in a safe, non-judgemental. Setting that facilitates communication. Learn about living andgain insights from others. Put their complex and developing ideas into words.Get to know families and friends, old and new. Discuss effectively and respectthe views of others. Develop compassion for and interest in others. Acceptthat differences need not create conflict. This version of TAOC is forchildren in particular, but all ages will love playing TAOC. Perfect for manyoccasions, the informative 16 page communication booklet provides manyvariations on TAOC, including a solo version. TAOC is fun for everyone and isalso a highly effective therapeutic and educational resource for families,therapists, counsellors, teachers, speech pathologists, language teachers,coaches, church leaders and more.